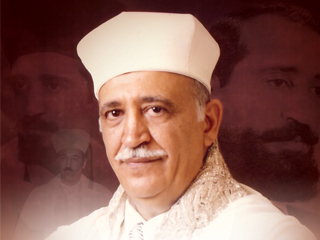 Raphael Yair Elnadav was born in Jerusalem to a prominent Yemenite rabbinical family that had immigrated to Jerusalem around the turn of the 20th century. As a young man, Hakham Raphael studied in Yeshivat Porat Yosef in Jerusalem’s Old City. He studied hazzanut under the celebrated Sephardic Hazzan Yaakov Levi. At the Conservatory Arzi Israeli in Jerusalem, he received advanced training in voice development, in violin and in theory and harmony of music. Under the aegis of Professor Moshe Cordova, he mastered the many maqamat of Oriental music. Simultaneously, he continued his Torah learning in Jerusalem’s Yeshivat Shaare Zion under Chief Rabbi Ben-Zion Uziel. He earned semicha (rabbinical ordination) from Rabbi Eliezer Waldenberg (1915-2006). In 1950, Elnadav married Bertha (Batia) Hassoun, and they settled in Tel Aviv where he was appointed chief hazan in Congregation Ohel Moed, the main Sephardic synagogue of Tel Aviv. Their eldest son, Yosef, was born soon after. By then, he had earned widespread acclaim in the world of hazzanut as a talented innovator, composer and expert in Sephardic liturgy. He was only 34, but tremendously accomplished – a shohet (ritual slaughterer), mohel, hazzan and rabbi – when the life-altering job offer came. An emissary from Cuba’s Sephardic community arrived in Israel, having been sent for the sole purpose of offering Rabbi Elnadav the leadership of the community. After months of negotiation and deliberation, in 1955 Elnadav agreed to take the position in Havana and served the Cuban community at every level – leading the prayers, performing marriages, funerals, answering halachic queries and supervising kashrut in Cuba, overseeing the shehita process twice a week. When Congregation Shaare Zion on Ocean Parkway in Brooklyn was in its planning stages, Mr. Isaac Shalom a’h spoke to Rabbi Elnadav and expressed his hope that the young hazzan would consider a position in the Syrian community once the Shaare Zion building was complete. In 1959, together with his two children (the youngest, Esther, was born later, in America) and parents-in-law, he moved to New York and assumed the position of Chief Cantor, a post he held for 21 years until his retirement in 1980.